I’d be the first to admit I’m not the biggest Miyazaki fan. All of his films have moments of brilliance, and they are gorgeously animated, but there are so many that leave me disappointed. This is not the case with The Wind Rises. For me, this is his best since My Neighbour Totoro (Tonari no Totoro). A highly fictionalised account of the life and work of Jiro Horikoshi (Hideaki Anno), and adapted from Miyazaki’s own manga, The Wind Rises is a period drama that has everything you want in a Studio Ghibli film. We have wonderfully quiet moments, colourful vistas, fantastical sequences and an unerring ability to find beauty in the mundane. Jiro is an engineer who dreams of creating the perfect flying machines. The problem is that he knows his aircraft will be used for war. Set in the years leading up to World War II, there’s a sense that something horrid lies in wait in the near future, and Jiro is conflicted about his creations. At the same time, he falls in love with Naoko Satomi (Miori Takimoto), a young woman whom he meets during the Great Kanto Earthquake of 1923. I only recently saw Ponyo (Gake no ue no Ponyo) for the first time, and I found it to be an absolute mess. Very little of that film worked for me, so I was nervous that perhaps Miyazaki’s final film would similarly disappoint. I needn’t have worried. The Wind Rises is a touching film. It has a steady, graceful pace, and whilst it probably could have done with 20 minutes chopped out of the 126 minute runtime, I was never bored. 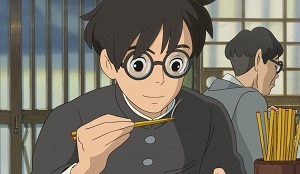 There really is a good case to be made that this is Miyazaki’s masterpiece. It feels like his most mature film, and the effortless way it manages to hold back, avoiding melodrama whenever it can, is impressive. The backdrop of war, and the Japanese aircraft manufacturer’s uneasy relationship with Germany is hinted at, but never truly becomes the focus. The Blu-ray presentation is excellent, and also features a picture-in-picture function where you can watch the film alongside the complete storyboards. There’s a 90 minute press conference with Miyazaki and other important figures from the film (something for which I don’t have the patience) as well as a ten minute featurette with the American voice cast. If you’re a fan of Studio Ghibli, then you’ve probably seen this film already, but if you haven’t, The Wind Rises is a real treat. If Miyazaki really has retired, then he’s done so on an amazingly high note. The Wind Rises is available now on Blu-ray and DVD from Madman. This entry was posted in Film Reviews and tagged Anime, Biopic, Drama, Period Drama, Romance by Stuart Wilson. Bookmark the permalink.